Find the Weber Performer® Deluxe 22” Charcoal Grill at Foreman’s General Store in Colleyville, Texas. Come see our selection and learn from the best in Colleyville, Texas. Weber combines the best of their iconic charcoal grills with innovative, convenient features in the Performer Grill Series. Made of premium-grade U. S. Steel coated with black porcelain enamel inside and out, the bowl and lid of the Weber 22 inch charcoal kettle grill are precisely formed to allow heat to circulate evenly inside the grill and across the 363 square inches of cooking area. Porcelain enamel coating will not rust or peel, giving your grill years of top performance. The aluminized steel One-Touch cleaning system makes clean-up hassle free. As you rotate the handle, three blades in the bowl move ash through the vents and down into the removable, high-capacity aluminum ash catcher below, which is enclosed to prevent ashes from blowing away and creating a mess. The Touch-N-Go gas ignition system makes charcoal grilling a breeze by lighting the briquettes at the touch of a button using a disposable 14. 1 or 16. 4 ounce propane cylinder (not included). The adjustable, no-rust aluminum top vent provides the proper airflow needed for perfect grilling and, along with the built-in thermometer, allows you to control the temperature inside the grill. 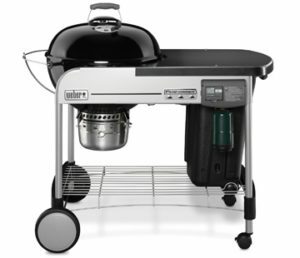 Weber Performer grills also feature hinged plated steel cooking grates, for easily adding more charcoal while grilling, a glass-reinforced nylon handle that will withstand the elements for the life of the grill, and a Tuck-Away lid holder that conveniently allows you to store the lid while you grill. The heavy-duty steel cart frame ensures the grill is sturdy and stable, while two crackproof all-weather wheels and two locking casters make moving the grill easy. The cart also has a thermoset work table that adds workspace, three tool hooks, a charcoal storage bin and a wire bottom shelf for storing grilling tools. Includes 2 Char-Basket fuel holders and a Weber cookbook. The Weber Performer Deluxe charcoal grill is where fun meets functional for your backyard BBQ!